I’m not really sure where this cream corn casserole recipe originated, but I can’t recall a single holiday dinner growing up where it wasn’t served… It was the first dish on the buffet that I’d hit at every Thanksgiving and Christmas meal and the first container of leftovers I grabbed from the fridge (if there were any). Though I’m not certain where it came from, it’s always been my Dad’s specialty. So my best guess is it was passed on by my Grandma Russell. She called it custard corn — which is a pretty good description of it — but I’ve also heard people refer to it as corn pudding casserole and a corn soufflé recipe. Call it whatever you want, just know that this baked corn recipe is AMAZING! 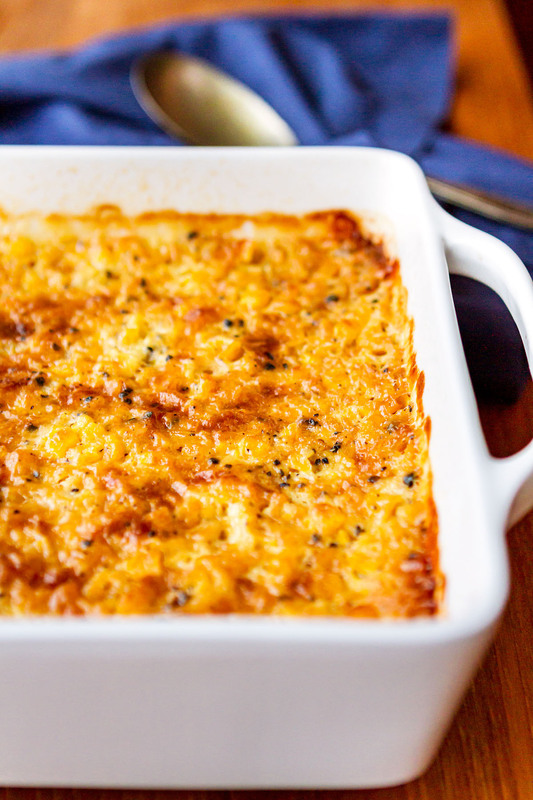 Why is this baked creamed corn casserole dish such a staple side dish? Partially because it’s so darn easy to make, even in large quantities. But mainly because it’s absolutely delicious whether it’s hot, warm, or cold! Seriously, my kids have been known to scrape the dish completely clean, getting every last bit of caramelized goodness from the corners. AND whether you’re making a deep fried turkey or an Instant Pot ham, it’s the perfect complement! Chances are you already have all of the ingredients for this creamed corn casserole recipe in your pantry right now! It’s comprised of just 6 ingredients: canned whole kernel corn, canned creamed corn, sugar, flour, eggs, and butter, plus a touch of salt and pepper. I’ll warn you ahead of time that this recipe does contain a good amount of sugar… Please keep in mind: this is an heirloom recipe that’s been passed down through my family. I always prepare it exactly as written, because it’s a special occasion side dish. Yes, it’s a little decadent, and I’m perfectly okay with that — because “everything in moderation.” Ya know?! But if you’re truly concerned, decreasing the sugar shouldn’t hurt the outcome. There is a high probability that you’ll want to double, or even triple, this corn casserole recipe at some point. The good news is, yes, you absolutely can! Just use a larger baking dish, and keep in mind that you’ll need to increase your baking time slightly. I should add that even when you’re not increasing the recipe, cooking time can vary by oven. Larger, shallow dishes will cook faster than deeper dishes. The corn casserole is done when the center is set and the top has that great caramelized appearance. If it seems set but isn’t caramelizing, you can just pop it under the broiler for a couple minutes to finish it off. 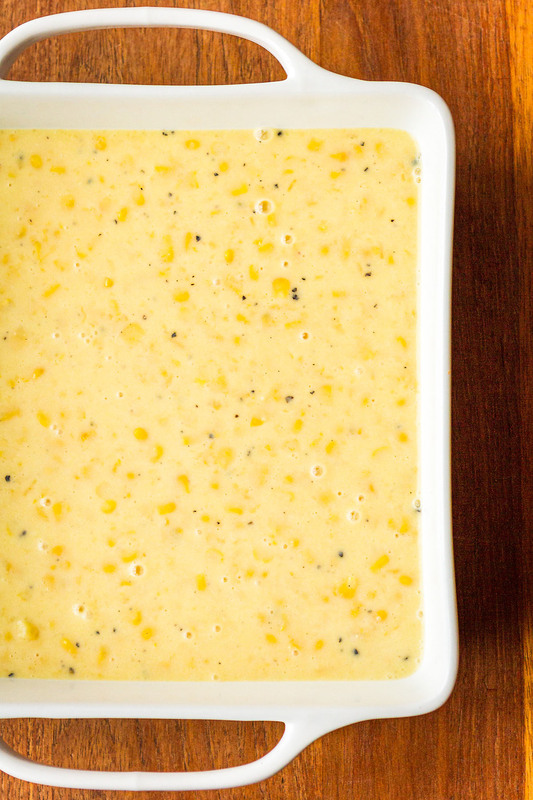 Give this easy corn casserole recipe a try at your next family gathering. It just might become your go-to side dish recipe, as well! PIN IT NOW! CLICK HERE TO ADD THIS CREAM CORN CASSEROLE RECIPE TO YOUR SIDE DISHES BOARD ON PINTEREST! This custardy cream corn casserole recipe is SO good you'll want to scrape the dish clean to get every last bit of caramelized goodness... My favorite of all the corn casserole recipes I've tried, just like my grandma made it! In a sauce pan, heat the butter slowly over medium-low heat, swirling the pan until it's just melted. Set it aside while you measure out the rest of the ingredients. 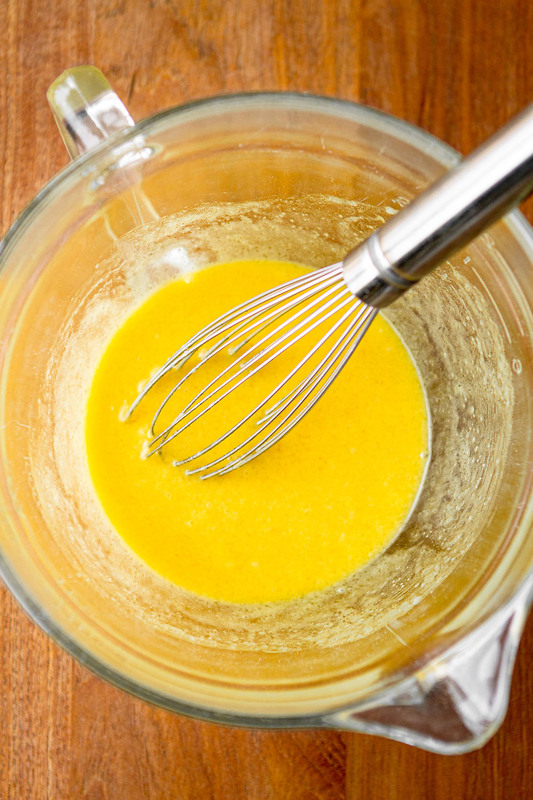 Whisk the flour into the melted and cooled butter until well incorporated. Then whisk in the sugar, eggs and milk. Stir the creamed corn into the butter mixture, along with the drained whole kernel corn. Season with salt and pepper. Pour into a shallow 8x8" baking dish. Bake uncovered at 350 degrees for approximately 1 hour and 15 minutes, until the center is set and the corn casserole is brown and caramelized on top. Let stand for 5 minutes, serve warm. I highly recommend reading through the corn casserole recipe FAQs to achieve the best results with this recipe. This easy green bean casserole recipe is my family’s version of the classic recipe and uses only 3 ingredients, including canned green beans… Because who needs another complicated side dish recipe? NOT this mama! I’ve received a TON of questions about how to make corn casserole over the years. Though I’ve answered them all in the comments, it’s getting to be quite a bit to wade through. So I’m going to add the most frequently asked questions for this baked corn casserole recipe below, and I will continue to update it as new ones come in. 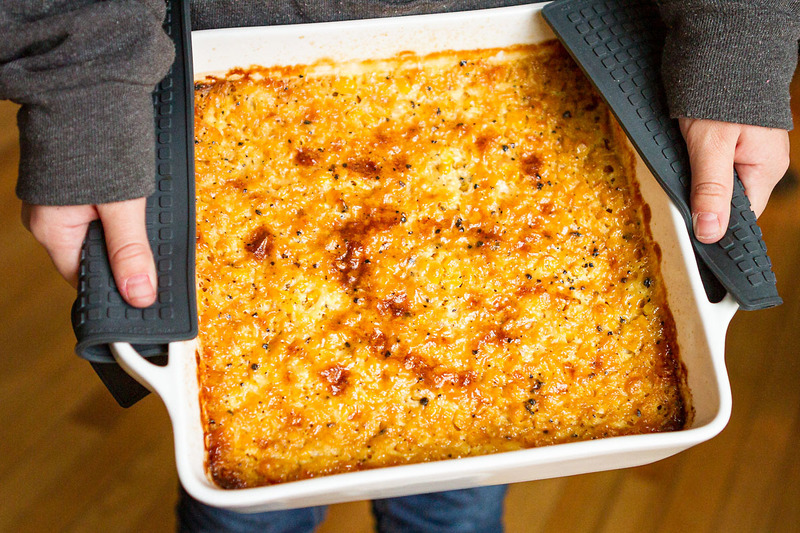 What type of baking dish do you use for this corn casserole? I generally use a shallow 8×8″ baking dish when I make this recipe. If I’m doubling or tripling it for a potluck or cookout, I’ll size up to this 9×13″ baking dish. If you need to go even larger, I’d recommend something like this large roasting pan. Note that I do not recommend using those large disposable aluminum trays. Aluminum is not a great conductor of heat, so it takes significantly longer to bake this recipe in them. And you probably won’t achieve the same amount of caramelization — which is totally the best part! Help, my corn casserole seems curdled! Where did I go wrong? 1| It could be that your oven is running a little hot… This could cause the corn casserole to cook too fast, in turn causing the custard consistency to “break”. You can check this with an inexpensive oven thermometer that can be picked up at Walmart and the like. 2| It could be your milk… I’ve always purchased whole milk, so it never occurred to me that it could affect the consistency. But apparently the lower fat percentage in skim milk and such can also cause a custard to break. Do I *need* to use whole milk? As I mentioned above, you do need the fat in the milk for a successful custard. That said, readers have reported using heavy cream and 2% milk successfully. Can corn casserole be made ahead of time? While it’s best freshly made, you can definitely refrigerate it after baking and just warm it up again in the oven before serving. I typically makes two batches for Thanksgiving, one for the “Big Meal” and one to reheat with the leftovers. Warm in a 350 degree oven for 10-15 minutes, or until warmed through. I do not recommend microwaving it. Can corn casserole be frozen? Again, freshly made is always best, but you can make it ahead and freeze if you’d like. After baking, let the corn casserole cool completely. Then wrap it tightly with aluminum foil, label, and freeze up to one month. To reheat, bake covered at 350 degrees for 40 minutes. Uncover and bake for 20 more minutes. Let stand 5 minutes before serving. If you have further questions, please ask in the comments below! I’d love to see how your corn casserole turns out… Tag me @Unsophisticook on Instagram or use the hashtag #Unsophisticook so I can check them out. Enjoy! Finely chopped red pepper. Everyone loved it. That sounds like a great addition, Gayle — so glad you loved it! can you use sour cream rather than whole milk? Hi Arthur! Unfortunately, I’ve never made it with sour cream, so I can’t comment on how it will turn out. If you try it, please let me know! Have you ever made this with a gluten free flour and coconut sugar for paleo people? Hi Linda! Unfortunately, I have not tried it with these ingredients. Perhaps another reader will weigh in — or if you decide to give it a shot, please come back and share your results! Corn is not allowed on the paleo diet as it is a grain – go for a sweet potato casserole instead! Question: should the bottom and sides of casserole dish be greased? Hi Jeanie! No, you shouldn’t need to grease the casserole dish. I never have, and it’s always turned out fine. Found this recipe! I had to modify it a tont bit due to the time of night and not beinf able to get those ingredients. I used a defrosted frozen corn (instead of canned sweet corn). I also only had salted butter and 1% milk. I added pepper but did not add any additional salt. As I read above, having whole milk would have helped better with the custard. Overall my casserole came out well baked and delicious! It was perfectly sweet and gooey! I also wanted to note that I LOVE corn in general and probably eat too much of it in many forms and had been looking for a recipe that did not include using a cornbread mix (because I didnt have any on hand), and this was perfect! So happy to hear that, Nicole! I never have the cornbread mix on hand, either. I made this corn casserole in a 7 x 7 dish and it took longer to bake and set up. The butter was bubbling all around the edges of the dish and the top never got carmelized. I think the next time I will reduce the butter and increase the flour. Any suggestions from you? Hi Elsa! Yes, it’s probably due to the smaller size of the baking dish. It just means it will take longer to cook all the way through. A larger dish would make the mixture more shallow and spread out over a larger cooking surface. You shouldn’t need to change anything about the recipe, just continue to bake it until the top starts to brown. LOL, I totally get that! And actually, I just read an article the other day about getting best results with a pie crust recipe, and it recommended using either a glass (Pyrex) or tin pie plate because they heat up more quickly. I never really thought about it, but now that I am, I do think this recipe seems to cook more quickly in my Pyrex versus my glazed stoneware baking dishes. If I double the recipe and use the larger 9X13 pan, how much longer will I need to increase my cooking time?? Hi Crystal! I’m so sorry — I just found your comment in the spam folder. It will vary for everyone’s oven, but when I double it for the holidays, I allow 2 hours for it to cook. Typically it’s done much sooner (when it starts to brown and caramelize on top), but you won’t want to serve it straight from the oven anyhow. So basically I count back 2 hours from when we’re planning to eat, and that’s when I pop it in the oven. I love the idea of calling it custard corn! It sounds so rich and delish! I can’t wait to try your grandma’s recipe! This is an incredible side dish! I just loved the flavors! I think this just might become my new favorite recipe for our Thanksgiving table! This looks so creamy and that caramelization – oh my! I think Grandma would be proud to take ownership of this one.